What are the important attributes of a yoga bag? In a blinded Facebook poll, we asked yogi’s to “choose the most ESSENTIAL features you need in a yoga bag”. We learned that the following are essentials… in order of importance: (1) quality and durability, (2) functionality and roominess, (3) self-cleaning and hygienic, (4) fashion and style, and (5) made specifically for yoga. Essentially, what this poll tells us is that yoga bags with these qualities are considered more valuable by yogi’s. Furthermore, 98% of you indicated interest in yoga gear bags designed to protect you from germs and unwanted microorganisms that are often found in workout environments. At ThePureBag®, we hear you! We’re creating a paradigm shift with yoga bags + protection! 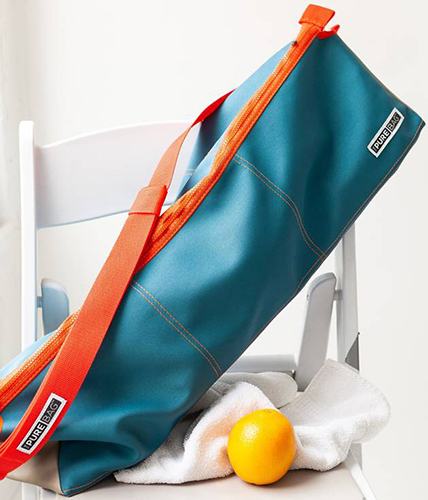 Our innovative yoga bags are both stylish and functional. We even incorporated a detachable, dual purpose strap so you can use it to stretch during practice! Most of our products are yoga bags for women. They are US-manufactured to high-quality standards and are available in cool colors like blue, black, orange, green and silver. These durable yoga bags provide ample room for your mat, your blocks, a towel and other yoga essentials. 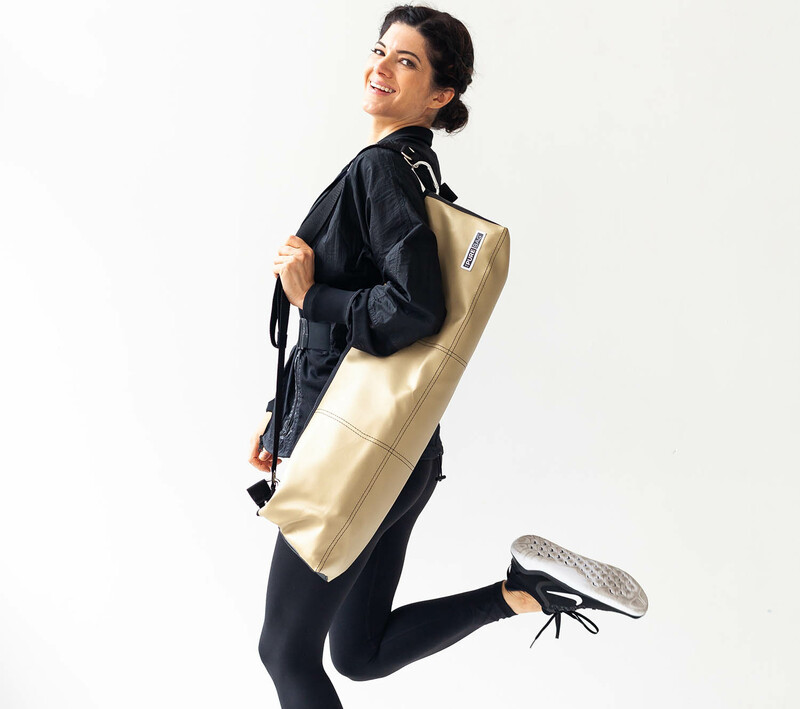 Our yoga bags are constructed of durable material with embedded silver ion technology to protect your gear from germs and bacteria – inside and out. Plus, they are water-resistant, UV-protected and abrasion-resistant. All of these essentials are thoughtfully integrated into the ThePureBag® in order to give you the perfect yoga bag! Our innovative line of antimicrobial yoga bags endeavors to help keep individuals hip, clean & healthier with our Hypo-Microbial Style. In our FB poll, we learned that in addition to taking your yoga gear bag with you to both indoor and outdoor yoga class, you’ll also be bringing it into locker rooms and to the gym. You’ll also probably bring it with you to work, school, coffee shops, cars, trains and buses. If you purchase one of our yoga travel bags, you may even be bringing it on planes, outdoors, or maybe even on a yoga excursion to a place like India. With exposure to all of these environments, ThePureBag® antimicrobial yoga bags are designed to protect your gear from germs and other gross stuff. The word is spreading! The germs are not! 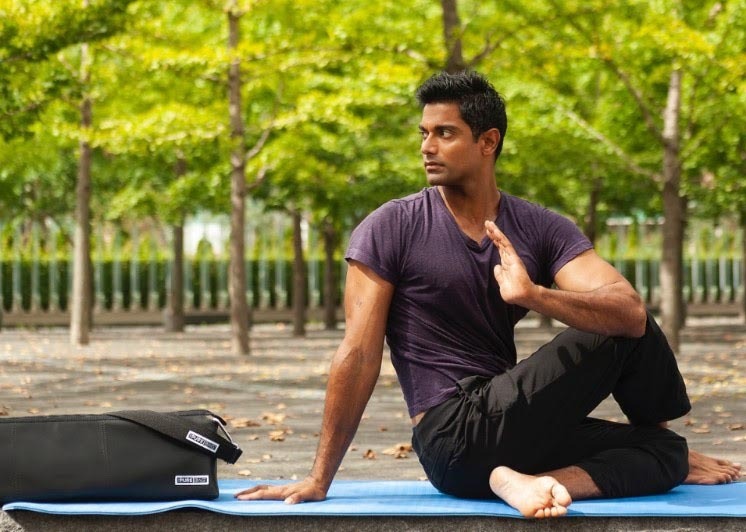 Why Choose ThePureBag® Yoga Bag? To sum it up, our yoga bag offers uncompromised quality, style and protection from germs. Unlike a cotton yoga bag, our bag defends against bacteria and other microorganisms. Our healthcare-grade vinyl yoga mat bag is durably constructed and is water, stain and abrasion-resistant – a truly weather resistant yoga bag. These gym bags for women and men are stylish, functional, roomy and spacious for your yoga gear. 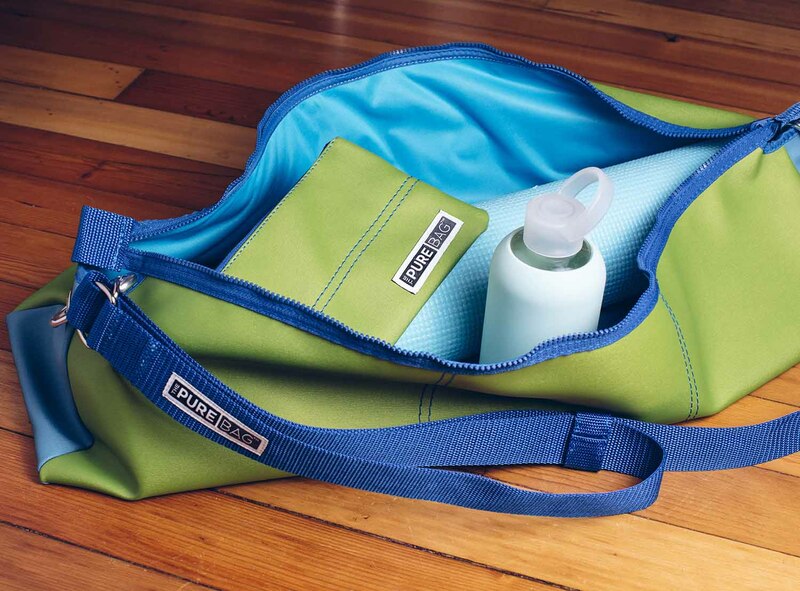 Our custom yoga bag even offers a detachable strap that can be used for stretching during class. To complement our line of antimicrobial yoga bags, we offer accessories: ZipPockets (a yoga purse bag) for your phone, cords, credit cards or makeup, a Cinch Bag (sweat bag) for dirty clothes, shoes or towels and a MatWrap to help protect your mat after practice. We are confident you will love our cool yoga mat bag for yoga mat and accessories! Antimicrobial Yoga Bags are Creating Buzz!